When you need broad, evenly dispersed lighting at your workspace, the Steelcase Dash LED Task Light is a sleek lighting solution that can help. Dual pivot points of articulation allow the Dash Light to adjust fluidly, letting you cast light where you need it. It's fingertip adjustable, as well, so adjustments are made quickly and easily. Light dispersion is broad, evenly balanced, and glare-free thanks to the precise angle of the light's LEDs, and also comes with continuous range dimming control. LEDs are rated for 50,000+ hours of use, for years of well-lit tasking you can appreciate. 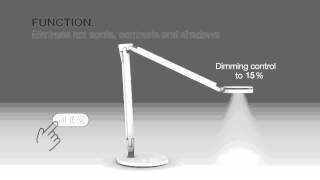 The Steelcase Dash LED Task Light is the office lighting solution that's there for all your work sessions and is available in a variety of colors to blend in with your office decor or add a pop of color to your workstation. Dimensions Max vertical reach - 22 3/4"
Max horizontal reach - 32"
The Dash task light is available in several finishes. The Dash task light is available two different mounting methods, a freestanding version, and a rail mount option which can attach to most slatwalls. This product comes standard with a 5-year warranty on driver and 10-year warranty on housing, structure, and hardware. $361.00 List Price: $540.00* The list price is the same as the MSRP (Manufacturer's Suggested Retail Price). It may not necessarily be the price at which the product is sold.